HE BEAUTIFUL CIRCULAR arrangement with the flags of the world descended from the center of the huge auditorium until it rested slightly above the heads of the people. With houselights dim and a powerful spotlight trained on the flags, the impact was tremendous! What an impressive way to emphasize that the Church of God is an international church! In the name of the Father (pounded gav­el), and of the Son (pounded gavel), and of the Holy Ghost (pounded gavel), I here­by declare the Fifty-eighth General As­sembly of the Church of God in session for the worship of our Lord and for any and all business that is duly come before it. Appropriately and beautifully sung soon after the official opening, the chorus “We Are One in the Bonds of Love” indicated the unity of the Fifty-eighth General Assembly from the opening of the General Council to the conclud­ing service when appointments were an­nounced. Congregational and special singing contributed to the worship services. 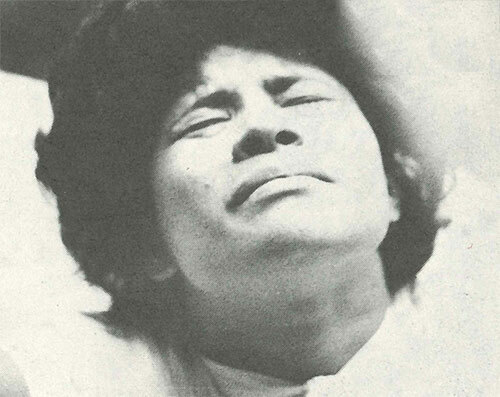 Moved by the Spirit, the entire congregation on oc­casion rose in praise. Messages in tongues with interpretation evidenced the presence of the Spirit and indicated God’s approval and blessing. Strongly emphasizing the need for reviv­al and pointing to the suicidal race for ruin in the world today, Brother Hughes soberly reminded the ordained ministers that the Fifty-eighth General Assembly of the Church of God could be our last one. The business was conducted smoothly and harmoniously due in great part to the efficient handling of the gavel by General Overseer Hughes. History-making and quite unlike any previous happening witnessed by most General Assembly ministers was the spontaneous offering on Wednesday night, August 13, of $200,000 for a Pentecostal Research Center and Library in the headquarters city of Cleveland, Tennessee. The facility will be used jointly by Lee College and the Church of God School of Theology. The unprecedented and unsolicited offering came in response to a proposal to construct a $2.5 million facility dedicated to the preservation of the history and development of the Pentecostal movement worldwide. It was a sovereign act of the Holy Spirit, and people began to give without prompting from the podium. As one ob­server commented: “People were dropping money from the balcony, and the Spanish speaking delegation sent a briefcase full of bills to the podium. The ushers weren’t passing plates, so people began putting money into boxes by the handful.” Members of the Executive Committee and Executive Council walked across the plat­form, praising God with hands raised. Dr. O. W. Polen listens with intense interest in General Assembly service. The $200,000 given mainly by the ministers will begin a two-year effort to raise the funds for the project. Money will come from private donations, contributions from college alumni and local congregations, and a possible capital funds campaign in the Cleveland, Tennessee, area. The General Council session was not solely given to business items. 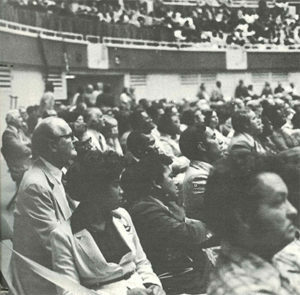 Profitable and inspir­ing time was also given to “Projections for the eighties”(Appointment of Centennial Committee, District Conferences on the Holy Spirit [June 8, 1981 ], Ministers Conferences-1981, Mobilization of Laymen-1981, Special Revival Efforts, Planting New Churches, Target Areas, Planning Guide for Church of God Ministries. Ministerial Jour­nal, and Ministerial Contacts). In 1972 a goal of one new church a day was set. Since 1973, one new church has been organized every day. To me the highlight of the historic Fifty­-eighth General Assembly was the introduction on Sunday morning by the general overseer of the Reverend Trandafir Sandru, Romanian church leader, editor of a religious newspaper, director of the Romanian seminary, rand member of the Romanian church’s executive committee. After extending a warm greeting, Brother Sandru received a standing ovation. I declare the Apos­tolic Pentecostal Church of God of Romania­- the Church of God of Romania. The Romanian church was founded by the Reverend G. Bradin who heard about the Pentecostal awakening in the United States in the early 1920s. God used the Reverend Paul Budean, a Church of God minister from Detroit, Michigan, to bring the Romanian church into contact with the Church of God. Through cor­respondence and a visit to Romania in the early 1920s, Brother Budean helped to plant a seed that has grown into a thriving Pentecostal group of about 1,000 churches and missions with a membership of more than 150,000. Brother Budean sent the Church of God Evangel and the Lighted Pathway to Romania, and from the Evangel the Romanian Pentecostal believers be­came acquainted with our doctrine and polity and accepted them as their own. 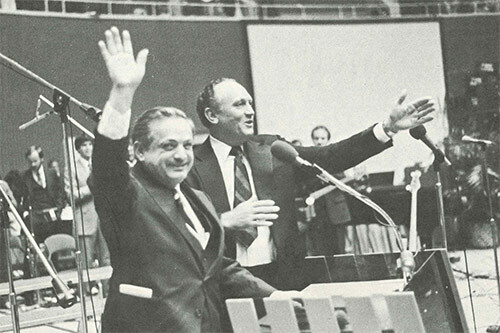 The Reverend Trandafir Sandru (left), Romanian church leader, was introduced by General Overseer Ray H. Hughes (right). After extending a warm greeting, Brother Sandru received a standing ovation. A moving part of the World Missions Service on Sunday morning was when prayer was offered for the hostages in Iran in keeping with a resolution passed by the General Assembly for their release. Numerous other activities took place prior to and during the General Assembly. The Evangel staff and I carefully considered how we could effectively and adequately cover this important event for our readers, especially remembering the ones who could not attend. We concluded that a pictorial coverage would be the most effective way. 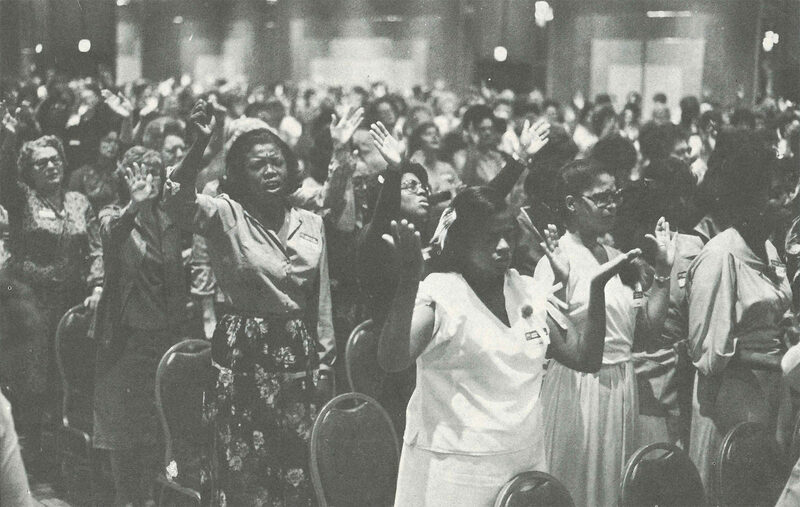 So, we trust that through the following pages you will enjoy a picture trip to the Fifty-eighth General Assembly of the Church of God held in Dallas, Texas, August 12-17, 1980.